A couple of years ago (in 2006), I started using the Nike+ iPod sensor while running. Iâve written several posts about it here.Â Iâve written about how to attach the sensor to your shoe without buying Nikes special shoes with pockets in the souls and Iâve written an api to retrieve the data from the Nike+ site with C# to use in other apps.Â I love the little device and it works perfectly with my iPod nanoâit gives me music and a measurement of how far Iâve run (roughly). But there are some things I really hate about the iPod Nike+ sensor. First, itâs not as accurate as it could be.Â The transmitter is attached to my left shoe, so it works like a pedometer.Â Iâm not a treadmill runner, so my self-pacing is terrible.Â My stride is based on the terrain or my mood.Â Itâs not consistentâbut itâs close enough.Â Itâs cheaper than shelling out for a Garmin Forerunner. Second, itâs wasteful.Â The transmitter in the shoe has a battery that canât be replaced or recharged.Â You have to buy a new one when it dies.Â Iâve been through two of them now.Â Last week I found that my standard three-mile run was registering as two and a half miles.Â The battery in my shoe transmitter was running low again.Â I really didnât want to throw this into a landfill somewhere and buy a new one for Â£20. Third, I canât get to my data easily.Â Nike has a website that stores all your run data.Â Itâs possible to get a feed of the data, but not officially.Â Some people out there have found ways to tap into this data (Running Tracker, Ear-fung.us, and myself) âbut they do this using an unofficial api into the Nike services (which sometimes changes).Â Nike wants to build their own running community (we need another community?). 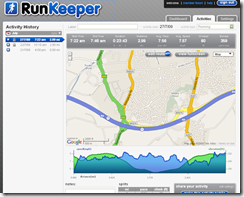 So, I started looking for an alternative.Â A few months ago, a friend at work told me about an iPhone app which uses GPS.Â I looked into it and started using RunKeeper, an iPhone app with an online service.Â Iâve used it on a few runs, and I will never use Nike+ again. 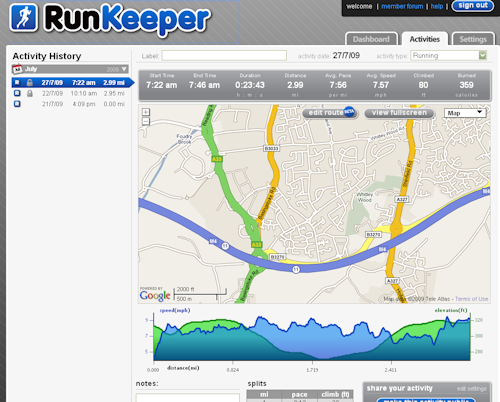 It maps your runs for you on Google maps and Google earth after the run. I donât have to buy a transmitter every twelve months. I can track bike rides as well as runs. I can still listen to music while running. There are some things I would like to see in the application.Â I still canât get to my data except through their interface (that I know of) so an open API would be nice.Â I need to turn off wifi before the runâwhich is not difficult, but the only awkward step (this is due to the way an iPhone works).Â And, Iâm not too crazy about the idea of taking my expensive phone out on runs with me.Â But aside from this, the application works great. If you are a Nike+ user, and you have an iPhone too.Â Try this app.Â You wonât go back.